Children and youth make up half of all refugee populations worldwide. In other words, 50 million young people are living displaced and disrupted lives, facing indignities and insecurities daily, lacking the promise of hopeful future. Education is a key factor in bring about positive change in the context of this crisis. Open Learning Exchange (OLE) is committed to bring about real change for children and youth, especially girls and young women, who are living disrupted lives. We work with a solution we call Planet Learning, an innovation that merges technology and leadership, which enables personalized learning. The Planet Learning platform provides a dashboard for each learner to access an abundance of learning resources, with functionality that is self-paced and learner-centered. It is low cost and low power, works off the internet and off the grid and, is a system designed to run on the smallest of devices for local implementation. 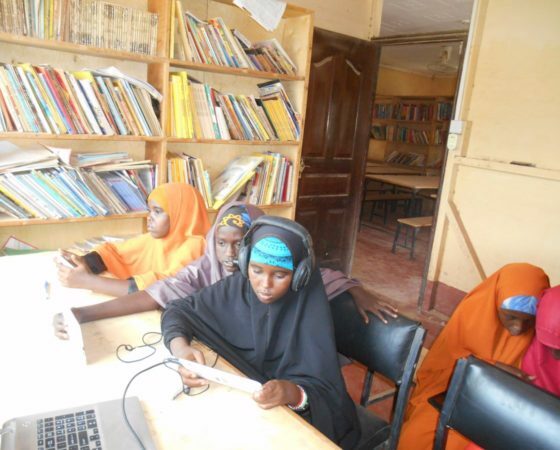 This week, we heard from our Somali partners at the Dagahaley, Hagadera and Ifo refugee camps in Dadaab, Kenya, where Planet Learning has been in use for the past three years. During this time, the platform has been used by more than 5,000 young people within the Community Learning Centres that are run by UNHCR. The stories they share are powerful and transformative; please read on and consider supporting the refugee coaches that are critical to this program. See below for the difference you can make! Our funding for this transformational program runs dry after this July. Currently, we are supporting 6 coaches who in turn support 500 young people (at any one time) to continue as learners and leaders. To sustain, we need just $2,000/month. To scale and enable this program to double in size during the next year, we need $50,000. Please champion this remarkable and collaborative effort. Make a real, positive difference in the lives of young refugees and invest in Open Learning Exchange now! This entry was posted in Blog and tagged Dadaab, education, Kenya, Refugee education, refugees, Somali refugees. Bookmark the permalink.